OMG Life's Autographer is a small 5 million pixel camera with an 8GB internal memory and a 3mm focal length lens that gives a viewing angle of 136 degrees and is designed to be worn clicked onto your clothing or hanging from a lanyard around your neck. Although there is an OLED, it can't be used for composing or reviewing images and is just for showing the camera's status and battery life in blue light. Image composition is left entirely to chance, and the camera takes shots automatically as it sees fit. Its wearable and easy to use ethos makes it similar to Google Glass the Memoto Lifelogging Camera. There are five sensors onboard the Autographer which detect changes in light, motion, colour and temperature. A magnetometer enables the Autographer to determine which direction the camera is facing, while an accelerator measures how quickly or slowly the camera is moving. The OMG Life Autographer uses the information from these sensors to determine the perfect time to take a picture. GPS technology is also built-in and can be used to tag images so that photographers can see exactly where the images were taken once they are downloaded. 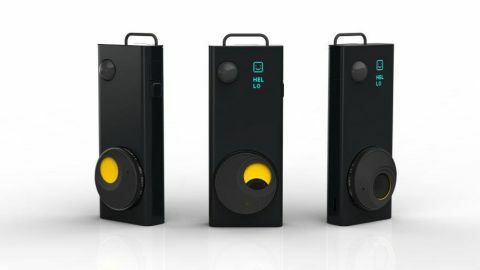 The OMG Life Autographer has three capture rates: Low, which will mean images are recorded at around 50 per hour, Medium (around 100 images per hour) or High (around 200 images per hour). Alternatively, you can press the Action button once to trigger the camera to take a sequence of nine shots. However, the idea is that you leave the camera to decide what and when to shoot while you get on with whatever it is you're up to. With a claimed battery life of 10 hours (we need to conduct further testing to verify this), the Autographer is capable of recording a couple of thousand images every day. Its 8GB internal memory is capable of storing around 28,000 images - approximately 12 days' worth of shooting. In some ways the OMG Life Autographer looks more like a digital audio recorder - or one of those emergency contact devices advertised at the back of some magazines - than a camera as it hangs around your neck on a lanyard. However, more observant people will notice a lens towards one side of a larger round plastic surround on its front. This surround can be rotated to act as a lens cap, showing a yellow disc when the lens is covered. Although it has an OLED, this is behind the Autographer's front cover, and it only becomes visible when the settings and so on are displayed in blue writing and icons. Considering its relatively high price of £399.99 (around US$510 / AU$565), the Autographer doesn't feel especially robust, and its shiny plastic body creaks a little in your hand as you hold it. However, it responds quickly to presses on either of its two buttons, and everything seems to work as it should. To be fair, it's also designed to be worn around the neck or hang from a piece of clothing, so it really needs to be lightweight. The Autographer is turned on by holding down the Action button, the lower of the two buttons, for five seconds. The word 'Autographer' scrolls across the OLED screen in blue letters to alert you to the fact that it's now active. Press the button again for five seconds if the lens cover is closed or the camera is in darkness for five minutes. Operating the Autographer is straightforward. Press the Menu button to reveal the options and use the Action button to make the setting choices. In fact these are incredibly simple and straightforward. The first press of the Menu button reveals the percentage of power in the battery, the number of images stored and the percentage of the 8GB capacity used. The second press gives you the option to set the capture rate, and pressing the Action button while this is displayed enables you to toggle through the High, Medium and Low options. Three presses of the Menu button brings up the Bluetooth connection option, and in this instance pressing the Action button turns the Bluetooth system on or off. Once it is turned on, the word 'Seeking' is shown in blue on the screen. Four Menu button presses reaches the GPS system, five enables you to turn the sound on and off and six enables you to specify whether a blue ring displays on the screen when an image is captured. OMG Life preloads the Autographer with software that can be downloaded to your PC or Mac when the camera is connected via the supplied USB cable. Once installed the software can be used to view, select and download images. You can also create stop-motion movies from the images. Images and movies may be shared on the Autographer cloud site too, as well as to Facebook, Twitter and YouTube via the desktop software. OMG Life also offers a free iOS app for the iPhone that enables you to view, tag, delete and share images, as well as to create videos and GIFs on the go. After the connection has been made for the first time, turning on the Bluetooth system on the camera will automatically start the app on your iPhone (provided that its Bluetooth system is on, too). We found the app works well and is easy to use. The OMG Life Autographer is never going to compare with a modern DSLR for image quality, and with such a wide angle lens (the angle of view is 136 degrees) there's always going to be some distortion visible. It's really more akin to an action camera such as a GoPro, since it's designed to capture random moments, unposed portraits and everyday goings-on as well as adventures. Although they are well saturated, colours are generally rendered fairly naturally, and its white balance system - which is entirely automatic - copes in a fairly wide range of situations. The exposure system also does a petty decent job, but with such a wide angle lens there is plenty of scope to include bright skies, which can fool the camera into under-exposing the main subject. Given that the camera is designed to be worn when you're out and about, it's a little surprising that it produces quite a few images that are blurred, suggesting that the shutter speed isn't fast enough to freeze the movement. It is possible that this is connected with the carrying position of the camera, and we're going to be shooting more images in our full review to see if we can get to the bottom of it. The idea of letting a camera decide when to take a photograph as well as what settings to use might be anathema to many photographers, but if you bear with it it's actually quite good fun. And of course, it doesn't mean that you can't use your real camera at the same time. We think that the Autographer could be a nice addition to a photographer's kit, enabling you to shoot from a different angle and capture candid moments that a bulky DSLR won't allow. The ability to create stop-motion movies from the shots is particularly attractive. However, priced at £399.99 (around US$510 / AU$565) the OMG Life Autographer seems very expensive.